Just a quick note to let everyone know that my springtime seasonal sale expires at midnight this coming Sunday the 23rd. Buy a line-edit and critique for a writer friend, or for yourself; you needn’t use the gift right away, but can claim it whenever you desire. As usual, the seasonal special gets your standard-weight novel (or that of a friend) a line-edit and critique for $1000 instead of the customary $1500, and the purchase can be redeemed either now or later, as the recipient pleases. The internet, as usual, has changed everything. These days, any young sf/fantasy reader or watcher with access to a computer can connect with other likeminded souls in a matter of minutes, if not seconds. They may not be able to meet up face-to-face, but that’s not necessary, and wasn’t necessary even in the olden days. It’s enough, most of the time, just to know that there’s somebody else like you out there. A note: It’s also necessary to understand that this era came not just before the internet, but before the Geek Ascendancy. People who liked sf and fantasy and computers and techy/sciency stuff in general were pretty much universally regarded as weirdo loners, rather than as weirdo loners any one of whom might possibly have a greater net worth than the entire city of Chicago. When a collection of weirdo loners (and yes – I, too, was a weirdo loner) come together and discover that they are not alone in their weirdo-hood after all, the community that is created has both good and bad features, and a lot of those features are connected like good and evil twins. The fandom of those days, to give just one example, was tolerant of all sorts of social awkwardness and nonconformity (because we were entirely too aware, most of us, of our own flaws in that regard); the flip side of that virtue, unfortunately, was a willingness to put up with just about any bad behavior short of running away with the cash box. Post-internet fandom is . . . well, it’s different, in ways that as a pre-internet fan I’m not entirely capable of understanding. But the old pre-internet fandom is still around, and still inhabiting a lot of the same virtual and actual spaces as post-internet fandom, and the places where they rub up against each other sometimes chafe. I’m not sure what can be done about this problem, or even sure that it is a problem of the needs-something-done-about-it variety. The best we can do, I guess, is be kind to each other, and remember that we all love the same thing even if we don’t necessarily do it in all the same ways. Yes. From today through the 16th of April, my usual rate of $1500 for a line-edit and critique on a typical 80,000-100,00 word novel drops to $1000 (or $1030 for PayPal, to cover the fees for a non-personal transaction; using Google Wallet, if you’re set up for it, avoids this problem and is faster as well.) 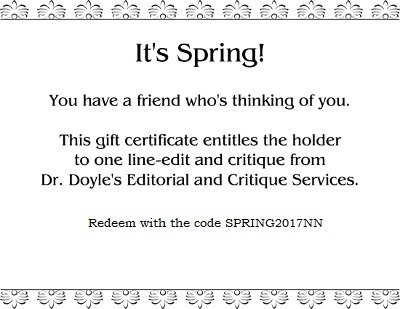 You can purchase a springtime gift for a writer friend, or for yourself, and redeem it at any time between right now and whenever. Where my co-author is going to be, tomorrow. (I’ll be in the audience, in my role as Magician’s Spouse.) If you’re in Merrimack and interested in stage magic, come on around! I’ll be one of the performers. Y’all come. Author Seanan McGuire (who is also Mira Grant and I think somebody else I’ve forgotten) has just received — on a tight deadline, of course — a beyond-the-copyedit-from-hell copyedit: The copyeditor did a global search and replace of “which” with “that.” Among other gross incompetencies. And there isn’t time to scrap the copyedit and send the MS back out to somebody better. People wonder why authors sometimes drink heavily. The amazing thing, actually, is that more of them don’t.